The Super Bowl is the kind of spectacle that's meant to be viewed with a bunch of friends in a state-of-the-art media room that has plenty of theater seats to go around. When you add delicious food, ice cold beverages, and thrilling game action to the mix, you have all the makings of an unforgettable day—even if your team isn't playing. 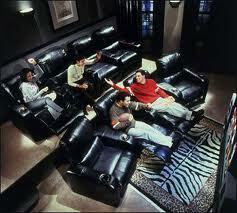 Home theater furniture. The best option would obviously be NFL-themed seating, such as pub sofas or recliners featuring your favorite team's logos. Failing that, theater seats with built-in cupholders and removable food trays will still let you and your guests enjoy the game in style. Color-coordinated decorations. Ambiance is everything, which is why you should include streamers, balloons, napkins, paper plates, cups, and tablecloths featuring the Super Bowl contenders' team colors. Food. The food you serve is likely to be even more popular than the game itself, so make sure you have enough for everyone. Pizza, ribs, hot dogs, burgers, fried chicken, subs, and chili are all standard Super Bowl fare, as are appetizers, assorted finger foods, chips, dips, and pretzels. Drinks. Football and beer go hand-in-hand, but make sure you also have nonalcoholic selections such as soft drinks, juice, or coffee for the non-drinkers and the designated drivers. A Super Bowl pool. To keep everyone interested in the game even if the local team isn't playing, have a pool for predicting the score after each quarter and/or the final score. Of course that also means you have to have prizes for the winners! You and your friends might not be able to afford a luxury box at the Super Bowl, but watching the game on a huge flat-screen from your very own theater seats is definitely the next best thing. If you don't have the above items yet, there's still time to pick up the food and decorations or place an order with TheaterSeatStore.com to get brand new home theater furniture Quick Shipped for the event.